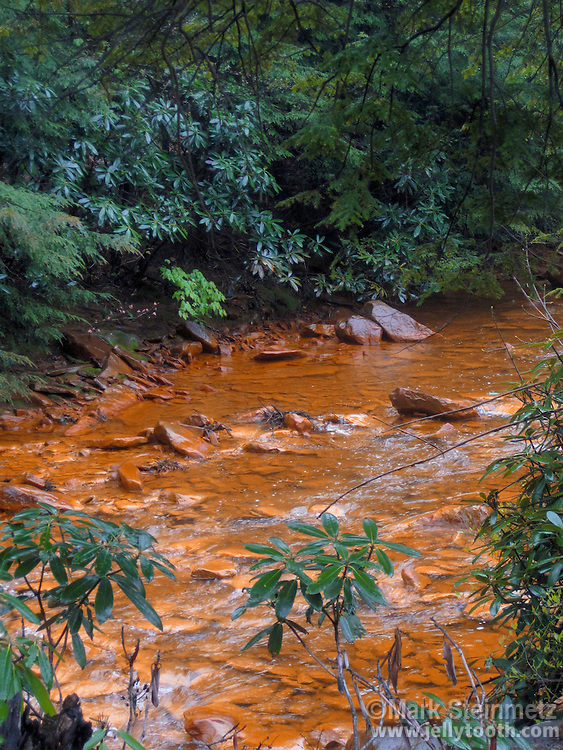 Martin Creek, close to its confluence with Muddy Creek, is heavily polluted by acid mine drainage (AMD) from coal mines in the area abandoned decades ago. Not far upstream of the confluence Muddy Creek is clear enough to support native brook trout. The orange sludge in Martin Creek is caused by oxidation of sulfide minerals closely associated with coal seams, particularly pyrite, which produces sulfuric acid that subsequently precipitates iron into the water. The increased acidity and dissolved metals effectively result in a stream devoid of living things. The Cheat River watershed, West Virginia, USA.